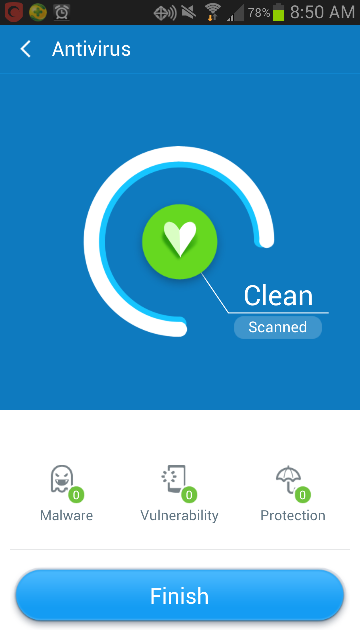 360 Mobile Security is an Android antivirus app that is published by Qihoo which is the same company that makes the desktop security suite 360 Internet Security 2013. This app uses 2 scanning engines which is a new idea for mobile devices and those engines are the 360 cloud Engine (Their Engine) and the QVM 2 engine. These 2 engines are able to detect a large bulk of malware, and they can do it without slowing down the device. This app comes with a unique approach to your phones security and has a few other tools that you would be interested in especially if you want to keep your Android device fast and secure. The image to the right show you what happens after you do a quick or full scan as you can see my device was found clean of malware. The app does not come with auto scanning features however it does alert you upon entering the app if you have not scanned your phone in a long time. The app only comes with 2 scans and those are the Quick Scan (apps) and the Full Scan (apps and files) we should be expecting a custom scan in the future but as of now we are not sure what we will see in the future. The app is still very new and has about 50,000 downloads off of the Google play store. However,the app does have a 4.8/5 Rating which is very good even for a new App. 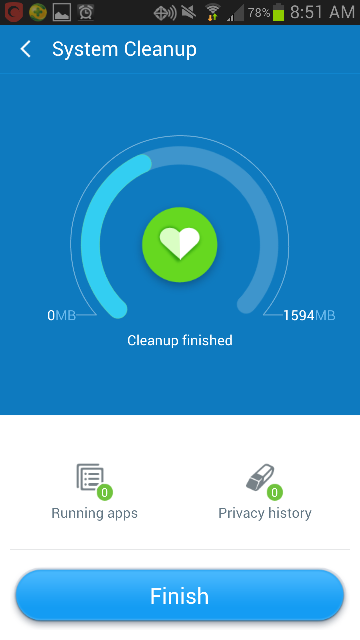 This app comes with a built in task manager that can close apps that are not currently in use, but keeps them in the memory so that you may return to the spot that you left off at. Let me explain most task managers when you close an app will close it entirely so that you will have to restart it. Well 360 Mobile Security wont close the app completely but leave it in the memory so that you can return to the spot that you left off at. If you really wanted to close the app you can use one of those more powerful task managers, but they have been known to have negative effects on the performance of the system. That is because when you use an app the system can remember information and leave it in a cache like system to make it faster the next time around. If it is closed completely the system needs to find that information again. 360 Mobile Security can clean your privacy so that your runnings apps are closed and your search history from certain apps is erased. 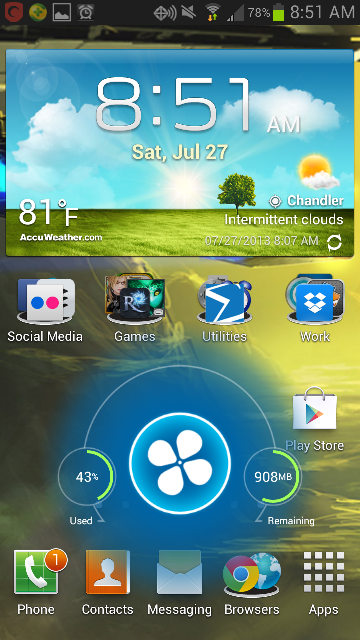 It also will allow you to close certain apps as opposed to it closing all of them for you. This way is better if you don’t want to close the system based apps so that way you wont experience like in some task managers the reset of your system UI which can be annoying. It does a good job at erasing the search history however it is rendered useless if you keep your search history across your Google account like me. 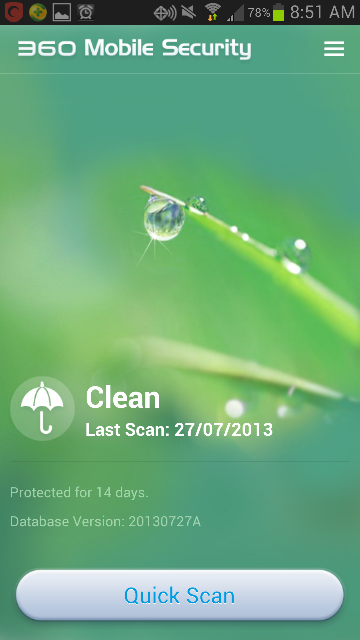 Now there is no cache cleaner which is why I use AVG Cleaner to do that for me. There should be an update where they will add this feature, but the company is trying to get this app and their desktop version updated and they need to translate the app as well which can take a while. If you wish to download the app please go to the Google play store here.